I noticed after changing the GPU stock fans to the Noctuas, the Fan tachometer monitoring shows random spikes at some points in the graph. Like, its sitting at around 700 RPM, but suddenly there is a single data point at 1600-1650 RPM (close to the max speed of the fan), than back to 700 RPM. It seems to happen at around 2 times per minute, at random intervals, and the "% fan speed" graph does not show a corresponding spike. Oh, also, 50% fan speed in msi afterburner actually corresponds to the max speed of my fans. I just bought a random sheet of black EVA, around 2 mm thick i guess. I've picked it because it's easy to work with, does not deteriorate and looks fine. But honestly any material that you can cut and is thick enough to fill the gap between the GPU and fans will do, even some cardboard perhaps. I do not use the fan grills. I'm using MSI Afterburner to control fan speeds. What GPU model are you using? I've got an EVGA 1070 FTW so should be close to identical as yours physically. No idea about the fans, sorry. I've mostly left this kind of thing at stock until now. Not sure about the spikes but I do think it can be related to the fan specs in the BIOS of the card not matching your new fans. You're probably never hitting the correct min. rpm for the fans? I see. I though 100% speed would be 12 V, but so its instead 3000 RPM (max stock fans RPM). Thank you. I'm not sure about minimum speed (450 RPM) as I did not try to go that low. I'll check that. About this setup Nanook, How will you setup your fans if using a Tempered Glass? With the windowed panel, I’ve tried bottom intake, and only rear exhaust. Make sure the C14S fan is blowing away from the motherboard. I’ve never had good temperatures with this setup... even with a 3000rpm 140mm fan screaming, my cpu still get very toasty. The tiny 92mm exhaust just can’t keep up with expelling all the warm air. Looks cool though. Only fix is to swap to bottom exhaust. For anyone running a high core count (6+ cores) Ryzen CPU & a Radeon VII GPU in the NCASE M1, what are you doing to cool it all & what temps are you seeing...? I am hoping Alphacool comes out with a version of their hybrid water block for the Radeon VII, thoughts on cooling with a single 240mm radiator (30mm or 45mm thick)...?!? Wow. Did not know that an 240mm was better than C14(S). Why arent all going that route then? Price? or is there some clearence issues or noise or ? Because of the stupid radiator noise, both idle and otherwise as well. People go air coolers instead of water coolers mainly because of noise. Then performance. This. I had a tower cooler, swapped to a 240mm rad ages ago, dropped temps 10-15 degrees, even with my gentle typhoon fans on it, the pump was just annoying. And the gurgling of the water annoyed me too. I'd rather sacrifice temps over silence personally! Now i run only the GPU to fend for itself, PSU facing outward, one 92mm heatsink fan and one 92mm exhaust. 92mm set as low RPM until they need to ramp up a little, but even then not much noise wise. GPU becomes the loudest thing over gaming. Don't think that 92mm exhaust does you any good. Probably just more noise for no real decrease in temperatures. Also, have you tried putting the side bracket as exhaust as well to see how the temps are compared to intake (I assume your C14 has both fans as exhaust as well)? I recently made a change to my PC which I'm really happy about. I had the "standard" 2 bottom intake fans and open air cooler GPU configuration, which in my opinion although the easiest, its not the best by far. 2 fans mismatched in size and position working that close seems counterproductive. I was thinking about replacing the GPU cooler with on of those aftermarket coolers, but I think the stock heatsink is actually well sized for the thermal load, and the shroud looks good. So I just removed the GPU fans and made a EVA cover for the bottom fans with openings matching the shroud openings where the stock fans were, so all the bottom fans' output goes through the heatsink. Also connected the bottom fans to the GPU fan header and made a custom fan profile, always on, ranging 600-1200 RPM. It actually works better than I expected! Light gaming does not go over 55ºC (somehow DMC5 on ultra is in this category? ), even at a lower RPM than my previous solution. Heaven now tops at 75ºC. In both cases it takes much longer to reach the equilibrium temperature. I can never hear it. GPU is an EVGA GTX 1070 SC, bottom fans NF-B12 Redux 1700. You have the bottom fans as exhaust or intake? Exhaust is usually the best, but it's always different based on different set-ups. Also, it's pretty annoying that all GPU manufacturer still provide the shittiest fan profiles ever, with GPU fans going from 0% to 40%, and there being nothing in-between. CPU fan control in Mobo BIOSes are bad as well (forcing 100% speed at 80C) in similar ways. SpeedFan is always the best way to go here. But yeah, taking off the fan shroud and just attaching fans at the bottom work really well on the GPUs that allow this. Much cheaper and simpler than a dedicated GPU heatsink. I remember in my previous NCASE build that after removing the shroud on my 1080 Strix and using 2 bottom P12 Noctua fans at around 1000 RPM max, the temps stayed the same (around 78-80C on load, which is completely fine) as GPU stock. But the noise was far, far better (I frankly find all modern GPUs to sound detestably loud as they are). So good that the coil whine noise started appearing and became the most annoying factor -- though easily solvable by an insignificant downclock and reduced voltage. Another tips to help improve temps is raising the bottom case feets by attaching new ones. They're expensive as hell, and really not worth it price/perf, but if you got money to throw away, these ones are nice. Hopefully, SFFLAB does something similiar in a future revision of the NCASE. I was stupid enough to not keep the C14 when selling my previous build, so now I'm searching all over the internet for a used one. Thinking of doing my next build similar to my last one, but this time with the upcoming 3600X + B550 boards and A12X25 fans instead. Hoping for improved thermals all around. If anyone considers selling their C14, let me know. Has anyone testet to use a blower style graphics card without the cooler cover? Such that, 2 Noctua 120x25mm Fans directly blow on the cooler as in-take fans. My guess is that would be pretty bad. The shroud works as a duct for the radial fan, if you remove it will blow air in every direction instead of through the heatsink, so it will be pretty much useless. Also, the heatsink is pretty small, tunned for high pressure and an specific airflow orientation, so even if you duct the axial fans directly to the heatsink, cooling will not be good. If you do not duct it, most of the airflow will also go everywhere instead of through the heatsink. But who knows... maybe its worth testing it. Thats the interesting point. I thought about the EVGA RTX 2080 Blower, where you can clearly see the cooler part. The interesting would be the direct hot air transport out of the case without the noisy radial fan. But seems like nobody tried it before. I came up with the question, because I finished my first Ncase M1 build. It's great, but the bottom fans get a bit loud when they reach >800 RPM. Think, there is some room for optimizations. Nobu and Engr62 like this. Necere, I hope you can answer this question. 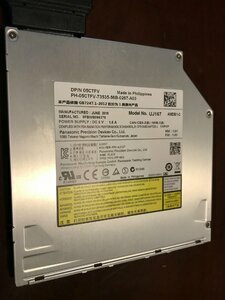 I picked up a used laptop blu ray drive to put in my NCASE M1 V4. It didn't come with any mounting screws. Do you know what size screws (see photo with screw hole circled) I should use to mount this in the NCASE M1? And maybe where I can get these? I'm sure you could get them from digikey, or a local hardware store (not big box, unless you want to cut the screws to length). Size, im not sure. Maybe M2, not too long. Remove the shroud. GPU fan + bottom fans is just a redundant addition of more fans, when you can get about same cooling temperatures without the GPU fans (by far the loudest part) present. Also, try the bottom Noctua fans as both outtake and intake to see which yields best result. For me, outtake was the best. M2 screws, and you should've gotten a few with the case in the bag with the rest of the screws. I hate to tell you this though - that drive isn't compatible with the bracket. 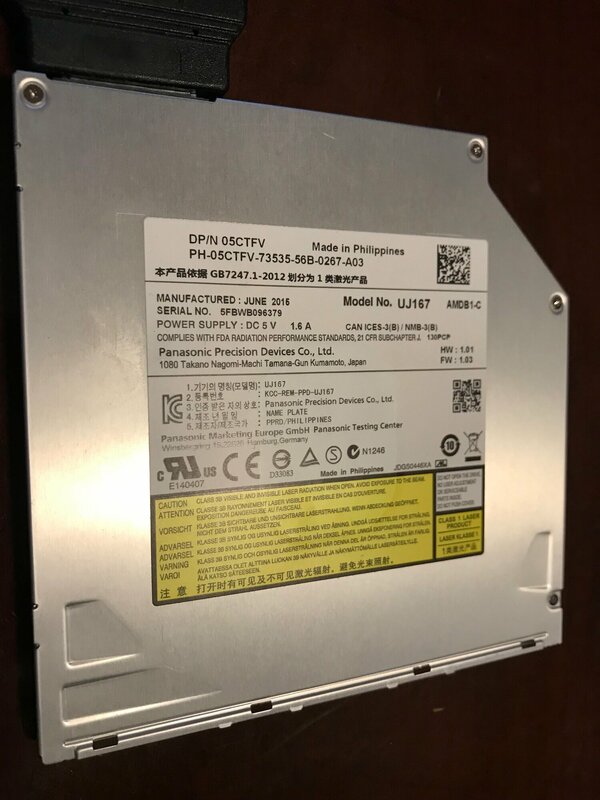 Slim optical drives come in two sizes (generally): 9.5mm and 12.7mm thick, and the bracket only supports the 12.7mm variety, as stated on the M1 product page on SFFLab. It's no consolation, but I've completely redesigned the bracket for V6 to support both sizes going forward. Thanks for the replies. That's too bad about the 9.5mm size not working (although the holes seem to line up with the bracket). I tested it out with a couple of thin paper clips bent to stick into the holes and it seemed to be OK. However, the drive would only rip at 2.1x speed (verses my external ASUS drive that does so at 6.5x). I'd probably be better off putting a 4 Tb 2.5" (15mm thick) drive in the front (if it fits) to boost my storage to 10 Tb anyway. It will fit, I had a 7mm SSD plus a 9.5mm HDD mounted in the front of mine. Check out this post on SFF, Necere talks about all the planned changes. I'd probably be better off putting a 4 Tb 2.5" (15mm thick) drive in the front (if it fits) to boost my storage to 10 Tb anyway. It should fit. 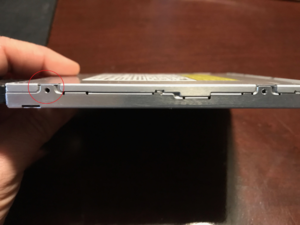 I have two 2.5" SSDs stacked on the front of my M1, at a combined depth of 14mm, and they fit with a tiny bit of room to spare (but only about 1mm). Necere is the best person to ask for a definitive answer, though. Do those fans on the case floor actually do anything, given that your GPU has a block and radiator? Are the case floor fans intakes or exhausts? Yes they help air circulation in the case, as they are wider than the GPU, I've got better temps when activated, you can feel the air flow even if they are close to the GPU. I do not make them spining very fast (max 1200), else they get noisy because of restriction. But No they do not "directly" cool the GPU, they only help circulation from the bottom to the rad. This card has a kind of waterblock all over the PCB so direct air on it do nothing for sure. Yeah, that makes perfect sense - and it did occur to me just after I posted! It's definitely good to have some airflow into the case. I'm looking to upgrade my GPU, and I have my eye on an EVGA 2070 XC which is a 2-fan card that's the standard 2-slot width and under 11 inches long. I'm currently running a 6700K with a U9S, with a second 92mm Noctua fan on the rear of the case (as an exhaust) and a 120mm Noctua on the side panel (as an intake). I'm contemplating adding one or maybe two 120mm fans to the case floor to aid with GPU cooling, but can't decide whether it's better to go for standard 25mm thick fans here or to go for slim 15mm fans instead. My reasoning for the slim fans is so that there's a bit of a gap for air circulation rather than the fans being super tight to the GPU. My current GPU is a 660Ti which is also two slots thick, but a blower, and I didn't find adding a 25mm thick fan to the case floor did much of anything for temperatures, but that might just be because it's a blower rather than an open cooler. Any thoughts as to whether slim fans are a better option than standard thickness ones? Low noise is a big priority for me so I'm concerned about turbulence with either option. I'm also undecided as to whether the fans should be intakes or exhausts, or whether I should reverse the existing fans so that air is drawn in the back of the case and then exhausted out of the side. That's easy enough to play around with, but I'd rather not have to buy two sets of fans for the case floor if I make the wrong choice initially! For sure, fans on the floor must be intake, never opposite to GPU fans of the 2070XC. I would go for standard 25mm, no problem they are near the GPU, it will push air through the GPU and help GPU fans. I have the 2080XC in the Case and can say the NF-A12 working fine. I have only a bit "noise" when I torture the graphics card over a long time. Then the EVGA fans are spinning up to 1600 rpm and they are loud. Overall, you will need fans underneath it, because of the airflow through the case. Else you will reuse the hot air from the card. An other question, will someone test the new Asetek as in-take on the backside of the case? With the TG side panel I would expect it to be better than the U9S.